Like Nikon, Canon and the many other campanies that produce binoculars, Pentacon Praktica are probably far better known for their cameras than their binoculars, where one of their first inventions, still used today was the roll film SLR camera. Praktica have used their expertise in making lenses for cameras to produce binoculars as well as other optical related products like video/camcorders and spotting scopes. A German company, the famous Pentacon factory in Dresden did close for a time after the fall of the Berlin wall when at the time Pentacon Dresden was the largest and most famous German camera producer. The first Praktica camera was built in 1949 and even though they now produce modern digital cameras, vintage Praktica Pentacon cameras are highly collectable. 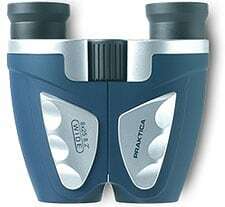 Praktica have a fairly wide range of binoculars almost exclusively aimed at the cheaper end of the market. With both porro and roof prism models, in full size and compact sizes available. Speciality Praktica binoculars include the Praktica Marine 7x50, their stylish theatre binoculars and Praktica zoom binoculars are also very popular. 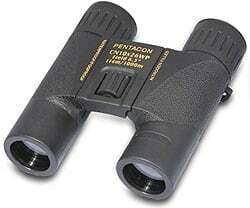 One of the most expensive and best quality Pentacon Praktica binoculars are their 7x50 Marine Binoculars. Designed specifically as Marine binoculars, they have all the features you expect to find in the best including an internal rangefinder scale and internal directional compass that is illuminated. It also goes without saying that thay are fully waterproof and nitrogen gas filled to prevent internal fogging of the optics. These coated porro prism marine binoculars come in dark blue rubber armoring and haveroll down eyecups and include a flotation strap that prevents the binoculars from sinking if dropped overboard. The 7x magnification is ideal for viewing at sea and the 50mm objective lenses give maximum light-gathering capability for a bright image even under twilight conditions. The Praktica Marine 7x50 IC binocular has a list price of £169.99 (about $200), but you can get them on Amazon for around £100. Praktica have a large selection of compact binoculars in theire range, with compact porro prism zoom binoculars, ultra wide angle compacts and a large selection of compact roof prisms. Most of Pratica's compact roof prism binoculars feature a double hinge design, which I go into detail on my post on the Best Compact Pocket Binoculars, but basically it points out that not all compacts are created equal and if you are looking for the smallest pair possible, ones that can easily fit into your shirt pocket, then it is hard to beat a roof prisim caompact with duel hinges. 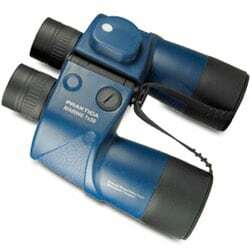 S' range, this binocular has an emphasis on style and WP binoculars are waterproof. Compacts with a Porro prism design, where the eyepieces are not in line with the objective lens have their own advantages in that the Porro prism design is usually optically superior to the roof prism design in medium and low cost binoculars because they are easier to manufacturer. 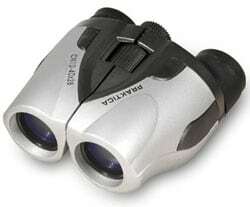 As well as the single magnification porro compacts, Praktica also make a number of compact zoom binoculars. Whilst it is true to say that none the world's most respected manufacturers of high end optics (I am thinking of companies like Swarovski, Leica, Carl Zeiss and Steiner) produce zoom binoculars, it is not to say that they don't have their place. To produce a binocular that can "zoom" does mean that you have certain trade offs, like the sharpness and brightness of the image especially at the higher magnification settings and I guess some manufactures are not willing to go there. Personally I prefer a good all round fixed magnification optic that has a high quality bright image, but if you do want a zoom binocular, Praktica produce some of the better ones on the market. All are Porro prism designs and most of their zoom binoculars are compacts apart from the Praktica CN10-30x50 with it's lever zoom action and large 50mm objective lens helps maintain a bright image even at it's maximum 30x magnification. 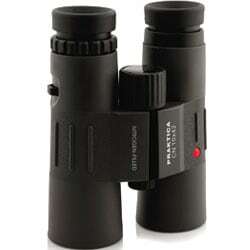 The value for money Praktica CN10x42 binoculars provide offer a lot for their very cheap price tag. One of the best looking binoculars in their range, these come with quality Bak-4 roof prisims and are fully waterproof and nitrogen gas filled to prevent internal fogging of the optics. Their optics are fully coated (not fully multi-coated) with anti reflective coatings, the body has a rubber armour coating and their screw eyecups provide plenty of eye relief eye-glass wearers. The Praktica CN10x42 has a standard tripod fitting point ( an additional bracket is required and is not included). Supplied complete with soft padded carrying case, neck straps and eyepiece rain guard. The objective dust caps are tethered to avoid accidental loss. 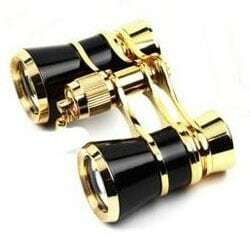 Praktica's 3x25 theatre glasses or opera binoculars have an elegant lacquered brass and ebony design. All optics and lenses are multi coated and come with a stylish with pouch to carry them with you to the opera or theatre.